The name Terry Fox has become synonymous with hope, perseverance and goodwill. His determination to fight cancer and prove that every dream is a step away from reality makes him a symbol of strength for Canadians and citizens of the world. 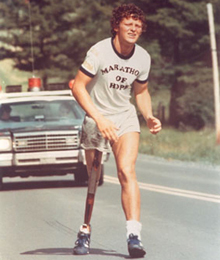 Losing his leg to bone cancer in 1977 at 18 didn’t deter Terry Fox from striving to raise money for cancer research and inspiring people with his 143-day Marathon of Hope, in which he ran more than 5,000 kilometres. Fox’s race ended when cancer was found in his lungs, but his legacy continues to this day through those that participate in the annual Terry Fox Run around the globe. September 18, 2011 marked the 31st run; to date more than $550 million has been raised. On Sept. 28, 2011, kids across Canada will also personify the hope that Terry Fox had by taking strides towards ending cancer. The Terry Fox National School Run Day gives kids a chance to participate in one of Canada’s leading philanthropic initiatives, inevitably following in the footsteps of a true northern icon.